Think about it – if you’re like most agents you’d like to double (or more) your income but even with record sales volume in Austin in 2015, real estate sales volume grew only 5% vs. 2014. So let me ask you, how do you grow your income by 100% or more when the market is only growing by 5%? Getting proven answers to this question is the purpose of the Millionaire Agent Lead Generation Master Class. Let me introduce myself. My name is Harold Ware, founder of Maxavenue. I have helped top real estate agents across North America double, triple, quadruple or more their incomes with innovative and proven marketing systems. I’m hosting a free, no-obligation, Lead Generation Master Class on April 4th – the only catch is that attendance is by invitation only and will be limited to just 29 people to allow more in-depth interaction. Our guest speaker, Dewey Whitton, is a Millionaire Agent who has been working with me for 5 years to implement the Maxavenue business and lead generation systems in Salem, Oregon. Dewey is now the #1 agent in Salem – last year she sold 134 homes – more than any other agent in Salem. Just in the last two years alone she has generated over 200 NEW customers and this does not include about 50 homes she sold from her past clients – all in 24 months. In 2016, Dewey will sell another 137 homes to NEW buyers and sellers plus she’ll sell dozens of additional homes with her past clients. This means Dewey will have sold a total of 403 homes in just three years. That’s more than 99% of agents will ever sell in their entire career – all in three years! 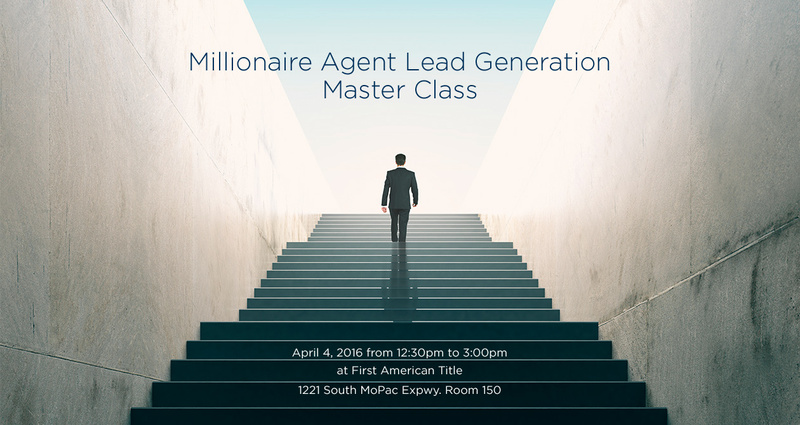 Attend this special Master Class and learn the secrets of being a Millionaire Agent Lead Generation Expert! Dewey is so thrilled with her amazing results that she offered to come to Austin to share her business and marketing secrets to help other agents breakthrough to another level in their business. I’ll be interviewing Dewey at the Master Class as well as sharing the key business and marketing secrets that helped Dewey become a Millionaire Agent. Attending this Lead Generation Master Class will forever change the way you look at your business as a Realtor®. When you leave this workshop, no matter how successful you are now, you’ll understand how to take your business to a much higher level. Space is Limited to Only 29 Agents — So Register Today Before the Seats Are Filled! P.S. You might be wondering why I would sponsor a free workshop that would normally cost hundreds of dollars to attend. That’s a reasonable question. By the way, NO products will be sold at the Master Class as we have NO products to sell. The real reason I’m putting on the free Master Class is that I’ve made it my mission to be “America’s leading consumer champion for buyers, sellers and investors” and I would love to be part of helping the real estate industry to “raise the bar of professional and business competency.” Also, I’m re-launching my brokerage company, Maxavenue, and wanted to give you a sneak preview of the “NEW” Maxavenue and what we’ve been working on the last few years. There is no obligation – just great content. Discover the little known business formula for Millionaire Realtors of how to earn 400% more gross commissions, work one-quarter the hours and deliver 4X the consumer value to your buyers and sellers. Sound impossible? When you see the formula you’ll be amazed at how much easier it is to succeed, rather than struggle, when you work smarter, not harder! Doubling or tripling your income (or more) doesn’t happen on accident – learn what type of training and education that Dewey practices to continually renew her professional and business knowledge and skills that gives her a permanent competitive advantage over other agents. Dewey dominates the Salem residential market like no other agent due to a combination of superior marketing, operational execution and the right people to help her leverage the smartest strategies and technology.